PERMAS JAYA, 12 Dec. 2010 – University students’ involvement in various community programmes will give them good exposure in serving the people. This is in line with a university education which is to benefit society, said Higher Education Minister, Dato’ Seri Mohammed Khaled Nordin. He was launching the three day 19th Optometry Service to the Community Programme (OPKOM) by the Optometry Club of the Faculty of Allied Health Sciences UKM here. 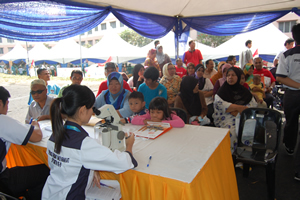 OPKOM forms part of the three day Fostering Healthy Community Carnival here beginning Friday co-organised with the Pasir Gudang Division of Umno Youth, the National Heart Institute (IJN), JASA and the Permas Jaya Flat Owners’ Association. 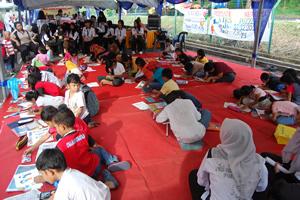 It aims at fostering close relationship between UKM students and the local community. 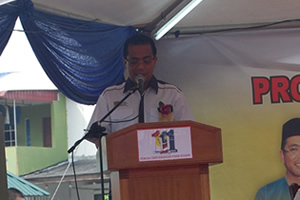 Khalid said intensive development of the Pasir Gudang area where Permas Jaya is situated had exosed the community to social problems and various diseases. UKM could further enhance its involvevement with the community by undertaking a more wholesome research in the area especially over the state of the general health of the community, he said. The findings will greatly assist in the planning of various activities and programmes for the development of Pasir Gudang. He was confident that the 19th OPKOM will not only improve the students’ knowledge but will help them to undertand the people better, to be more tolerant and conscious of problems faced by the people while improving their communications skill. Khaled said the people look up to a university as an entity that can assist them to overcome problems they faced in their lives. Thus it is incumbent upon universities to use the expertise that they possess in the service of the community. Various activities were held in conjunction with the carnival including exhibitions, talks, health checks and demonstrations on how to prepare a balanced and healthy food as well as activities for children and youths.